After the closing bell today, Apple announced results for fiscal third quarter, which largely is congruent with calendar Q2 (End date, April 27). Broadly: $49.6 billion in sales, $10.7 billion net income, and $1.85 earnings per share. Year over year, revenue rose 33 percent and EPS by 45 percent. 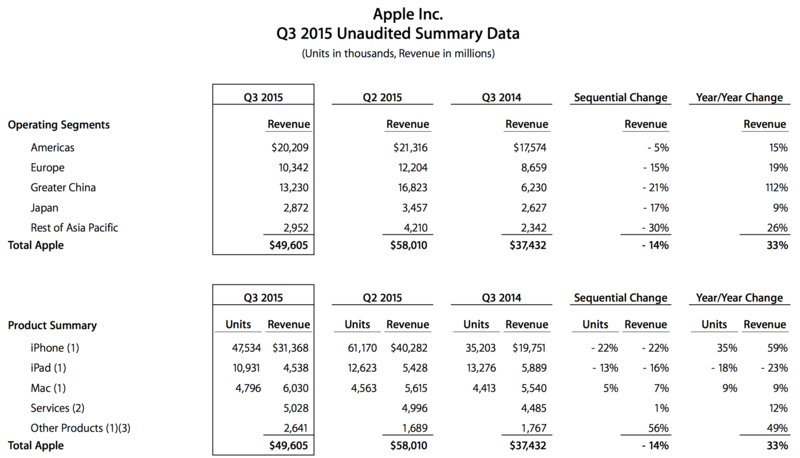 Apple guidance before the big reveal: Between $46 billion and $48 billion revenue. Wall Street consensus was $49.31 billion sales and $1.81 EPS. The Street’s estimates ranged from $46.9 billion to $53.64 billion. Gross margin reached 39.7 percent compared to 39.4 percent annually and 40.8 percent sequentially. Company guidance: 38.5 percent to 39.5 percent. Once again, international sales accounted for most of the quarter’s sales: 64 percent, which is up from 59 percent the previous year but down from 69 percent three months earlier. Device shipments for fiscal Q3: iPad, 10.9 million; iPhone, 47.5 million; Mac, 4.78 million. Apple ended the quarter with $202 billon in cash and securities. with 89 percent kept offshore. Official guidance for fiscal fourth quarter: Between $49 billion and $51 billion revenue and 38.5 percent to 39.5 percent gross margin. In early after-hours trading, Apple shares fell by as much as 8 percent. While Apple Watch distracts many, ah, Apple watchers, iPhone demands greater attention. The smartphone sells into a rapidly saturating category and accounts for the vast majority of company revenues. After years of double-digit sales growth, largely spurred by smartphones, the breaks are on. Gartner predicts sales growth slowing to 3.3 percent this year. The big problem is the world’s largest smartphone market. “The global market has been affected by a weaker performance in China”, Annette Zimmermann, Gartner research director, says in a statement. “We have witnessed fewer and fewer first-time buyers in China, a sign that the mobile phone market in there is reaching saturation”. Key to continued success: replacement buyers looking for premium-quality upgrades. That’s Apple’s category. The company already is cashing in. During first calendar quarter 2015, smartphone growth slowed into the single digits in China, according to Canalys. However, Apple’s position strengthened against local rivals Huawei and Xiaomi, while shipment volumes hit two-year lows for Lenovo, Yulong, and ZTE. “Consumers are losing their appetite for ultra-low-cost devices, as expectations increase in line with spending power and, combined with rising market saturation, this is resulting in a major shift to devices that provide better user experience”, Jingwen Wang, Canlys analyst, says in a statement. However, new sales growth will come in countries where low-cost and flexible terms, such as unlocked, non-contract devices supporting multiple SIM cards, matter. That’s a category where Apple shuts itself out. Many device makers “will be challenged to quickly enhance their expansion into emerging markets outside of China”, Zimmermann says. Despite, analyst doomsaying, during fiscal Q3, iPhone “gained share in all of our geographic segments”, Cook tells financial analysts today. Android switcher-rate is the highest ever measured by Apple. In China, iPhone sales soared by 87 percent. iPhone. Apple would be no juggernaut without iPhone, which accounted for stunning 63 percent of revenues—that’s up from 52.7 percent 12 months earlier. The company shipped 47.5 million iPhones. Wall Street consensus: 49 million. The smartphone generated $31.37 billion in sales. Year over year, revenue rose by 59 percent and unit shipments by 35 percent. However, sequentially, both declined by 22 percent. Average selling price was $660, up $99 year over year, offset by $24 in foreign-exchange rates. Meaning: ASP growth could have been much higher. Sequentially, the number is up by just $1. iPad. By contrast, Apple’s tablet business stumbled again—and by quick examination trails the path of iPod following iPhone’s release. Ironically, the mobile handset undermines the slate, too. Apple shipped 10.9 million iPads, down 18 percent year over year and 13 percent quarter on quarter. Revenue reached $4.54 billion, down 23 percent annually and 16 percent sequentially. Wall Street consensus: 11 million. Despite apparent category weakness, “I am still bullish on iPad”, Cook says, referring to new features coming in iOS 9, enterprise adoption, and consumer upgrades. “I see a lot of runway”. Apple Watch. The company’s wearable has no comparison, in its first full quarter of sales, which data was withheld. There are no immediate plans to do otherwise, Cook tells a financial analyst asking for something that might quell investors made jittery by recent news reports claiming weak sales. “We made a decision not to disclose shipments on the watch”, Cook reiterates, claiming that’s not lack of transparency. But he throws out a bone to a gnaw. “It would not be an accurate thing to just look at the sequential change or the year-over-year change and assume that were the total watch revenue”, the CEO says. That’s because of declines occurring with other products lumped into the category. During fiscal Q3, the category generated $2.64 billion, up 49 percent annually and 56 percent sequentially. Three months earlier, “Other” generated $1.7 billion, down 10 percent year over year and 37 percent month on month. From that perspective, it could be argued that the smartwatch contributed about $1 billion in additional revenue. If that’s failure, lots of companies would like it. “Sales of the watch did exceed our expectations”, Cook affirms, with sell-through exceeding launch of the original iPhone and iPad. “We feel really great about what we did”. He emphasizes that sales are not Apple’s primary objective but positioning the platform, particularly for the future. “We’re convinced the watch is going to be one of top gifts for the holidays”. Feedback from Apple Watch customers is very positive, Cook emphasizes. Ninety-four percent wear their timepieces regularly, if not every day. The potential for Apple Watch is “enormous”, and he calls launching the product a “privilege”. Mac. The PC business, while declining, remains remarkably robust. 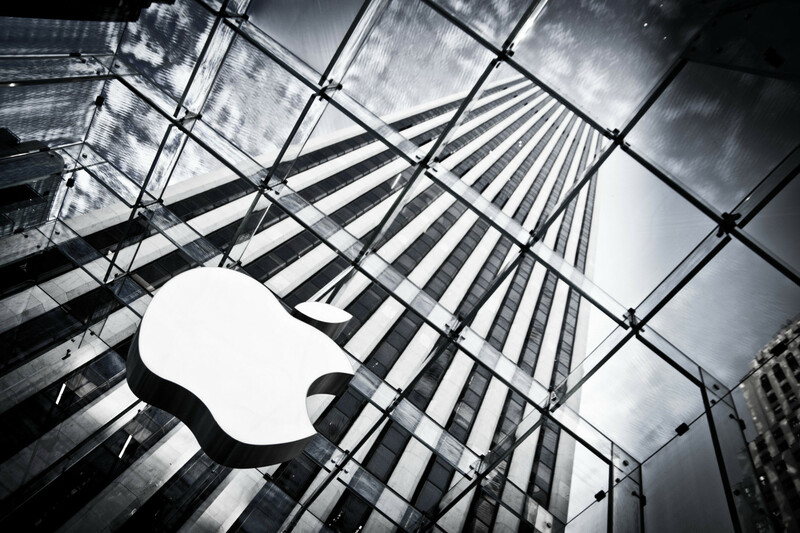 Apple shipped 4.8 million Macs, generating $6.03 billion revenue. Both rose by 9 percent year over year and 5 percent and 7 percent, respectively, month on month. Wall Street analysts expected 4.8 million. Services. The category is among Apple’s rising stars, as music and other cloud services revenues increase. For the quarter: $5.03 billion, up 12 percent annually and 1 percent sequentially. Among the standouts: App Store had its best quarter ever, with revenue up 24 percent.